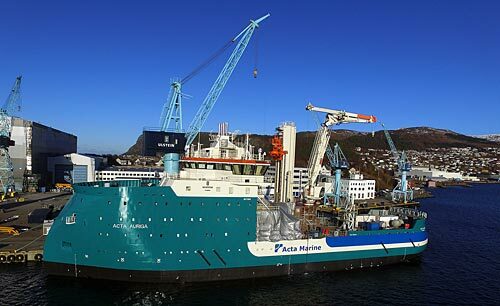 Acta Marine, which has an offshore walk to work vessel under construction at Ulstein Verft, has now ordered a second vessel. This SX195 design is a DP2 Walk to Work Construction Support Vessel (CSV) for the offshore industry. “Our first CSV, Acta Auriga, at Ulstein Verft will go for sea trials shortly, and we are very pleased with the progress of this project. Returning to Ulstein Verft with an order for a new sister vessel is a strong signal of the importance of the yard’s track record in quality and delivery precision, which is very important to us as ship owner and to our clients. We are quite convinced that the Acta SX195 vessels will create higher efficiency in offshore logistics operations and thus reduce the overall cost of constructing windfarms and, also, contribute towards a higher uptime of the installed base of offshore wind,” states Rob Boer, managing director at Acta Marine. “Acta Marine is firmly positioned in the renewable, and offshore oil and gas, markets. They challenged us in designing a highly flexible and compact vessel, with high capacities for long-term operations in the field, and this vessel is soon to be completed. We look forward to cooperate with Acta Marine again, to bring forward another highly successful W2W construction support vessel,” states CEO Gunvor Ulstein, Ulstein Group. The SX195 type designed, the 93.4-metre long and 18-m wide vessel is optimised for offshore wind. It has a large, centrally positioned SMST provided walk to work motion compensated gangway and elevator tower for personnel and cargo transfers. And further a 3D compensated SMST crane capable of 6-tonne cargo lifts. The optimised on-board logistics includes large storage capacities, of which half is under roof in a controlled environment, and stepless approach to the offshore installations. The vessel is equipped with a fuel-efficient drive system. In addition, a helideck will be fitted. With all main equipment and operations in the aft ship, the vessel will naturally operate astern while in-field. Keeping the X-STERN® towards the weather, there will be no slamming, noise or vibrations caused by the waves. The crew will get complete rest between shifts. “Acta Marine is stepping up its activities in offshore wind. These ship designs are flexible and attractive for work within areas such as O&M (Operation and Maintenance) or construction support especially in challenging weather and sea conditions,” says Rob Boer. The vessels are capable of year-round, North Sea offshore operations in up to 3-m significant wave heights. The safe transfer of service crews, cargo and spare parts, the in-field flexibility and high comfort are highly cherished by the charterers. The flexibility of these vessels improves the productivity when servicing the offshore wind farms.